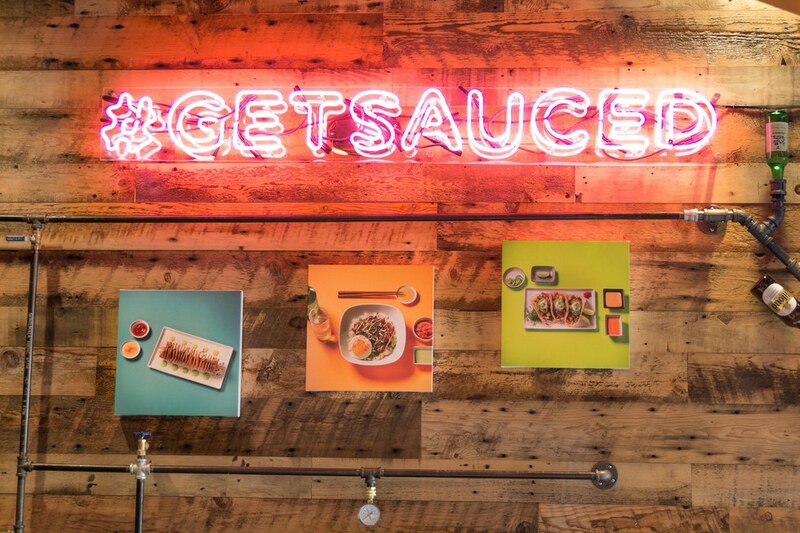 Too bad it's only open till 9pm because Saucy Asian's Korean-Californian mashups—burritos, bowls, tacos, and poke all topped with delicious sauces—have just the kind of flavors (and carbs) you'd want to soak up after a night at the bars. Inspired by the late night city vibes that first-time restaurateur Andrew Shinn experienced while living in Korea, Saucy Asian serves riffs on Korean street food against a backdrop of huge murals and neon signage and a soundtrack of upbeat pop music and funky rap. Grab some to-go noms along with their magical lemonade popsicle pouches and make a day of it at nearby Dolores Park. 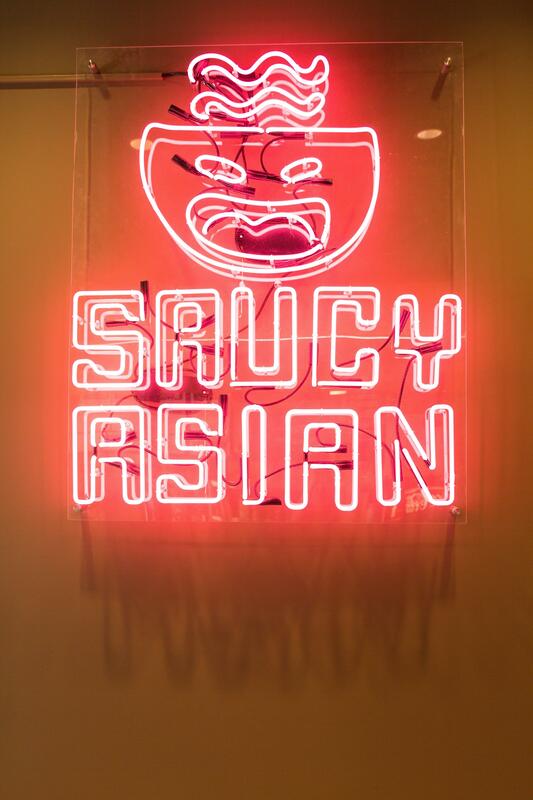 Saucy Asian catches your eye with their huge neon green signage, enticing customers to come see what this new spot is all about. This place is bold! 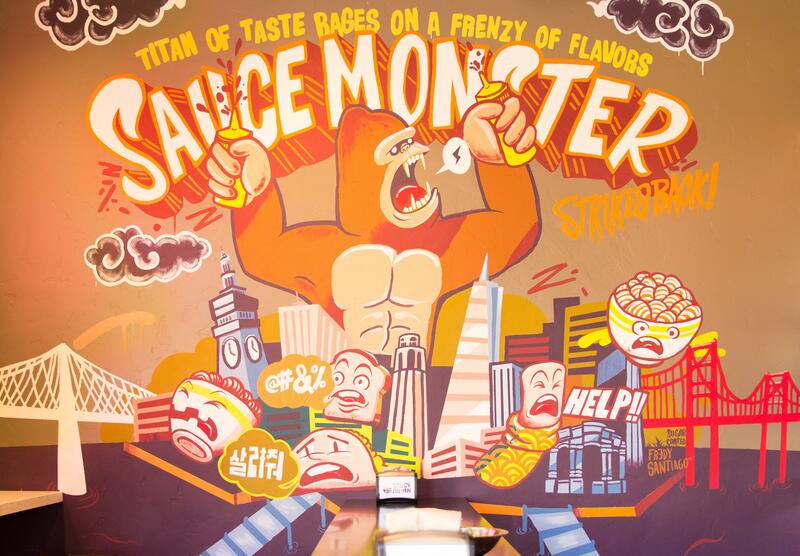 A huge, funky mural presents a mashup of Asian food, a King Kong-esque character, and an abstract San Francisco cityscape. Instagram-worthy pink neon signs remind you of non-stop city nightlife of Asian cultures that keeps going till the early morning! 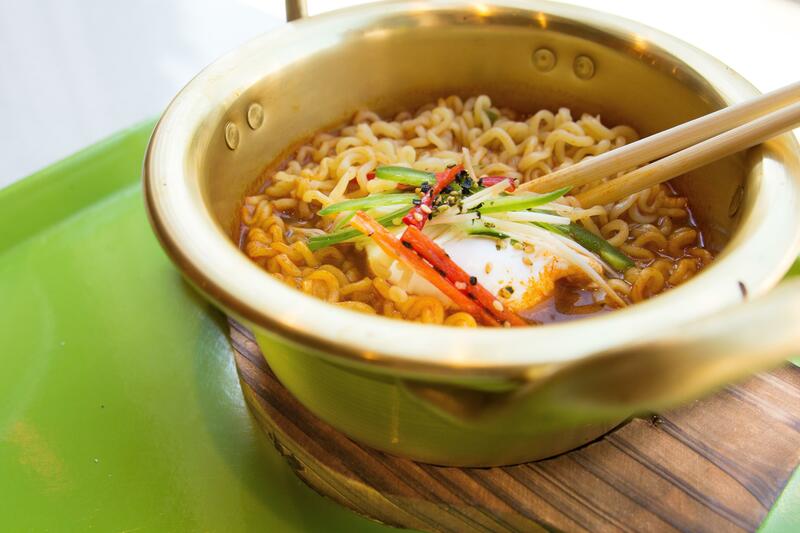 Enjoy daily specials like this delicious, comforting bowl of ramen. 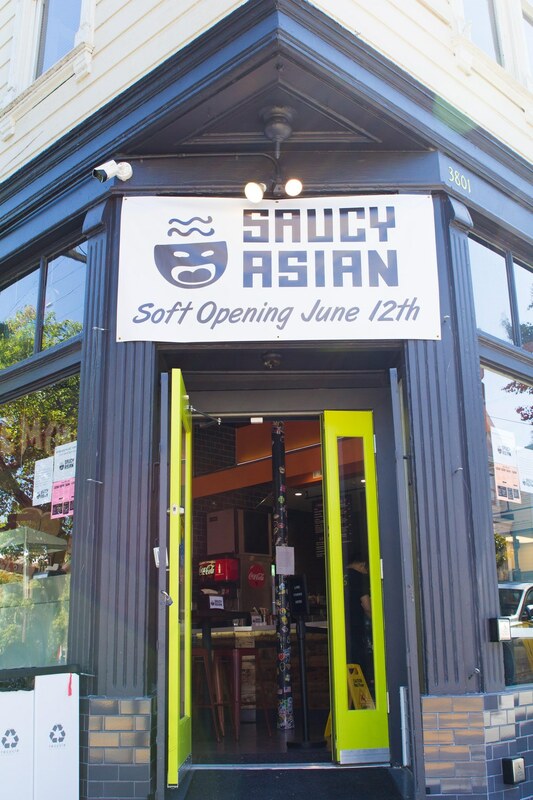 Saucy Asian has a number of bowls such as a burrito bowl or bibimbap bowl. The classic Saucy Asian Bowl (above) comes with rice, lettuce, slaw, kimchi, carrots, fried shallots, and, of course, gochujang aioli sauce! 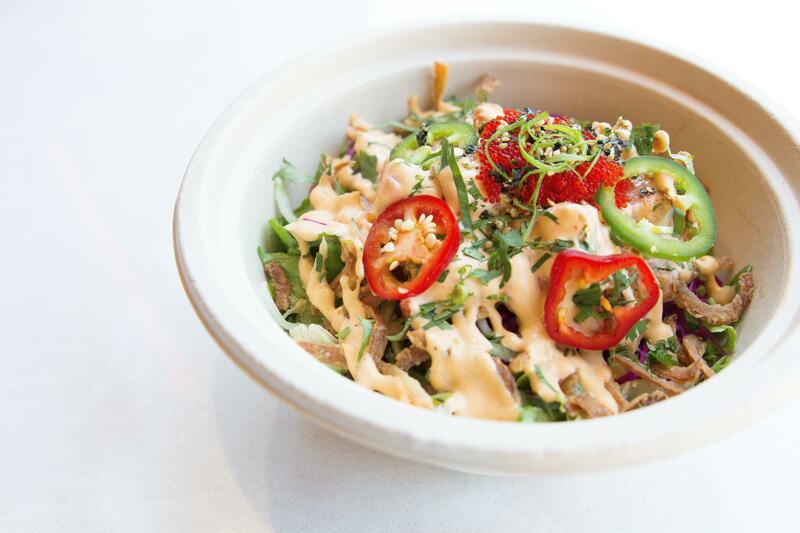 Poke lovers will enjoy one of three different poke bowl options with either salmon or tuna. 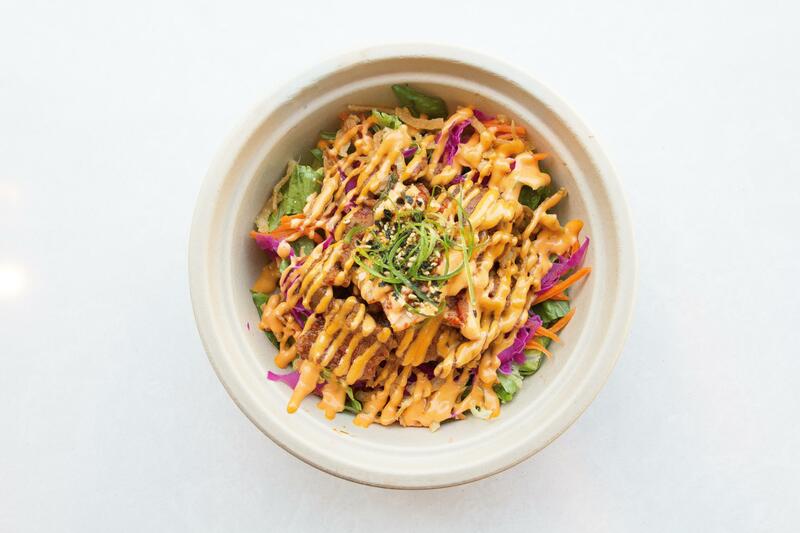 We won't say no to the Spicy Poke Bowl with rice, jalapeño slices, slaw, cilantro, lettuce, fried shallots, tobiko, and gochujang aioli sauce. Get a spread of everything to share with a big group! 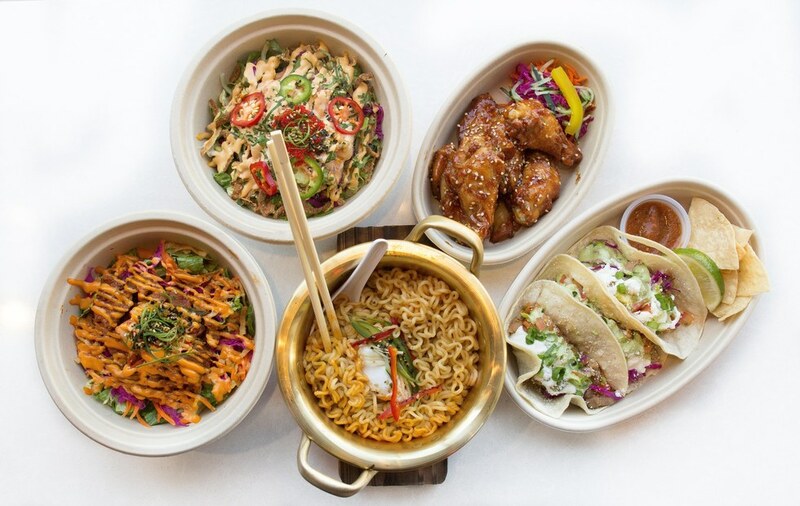 Trust us, you're going to want everything on this menu. 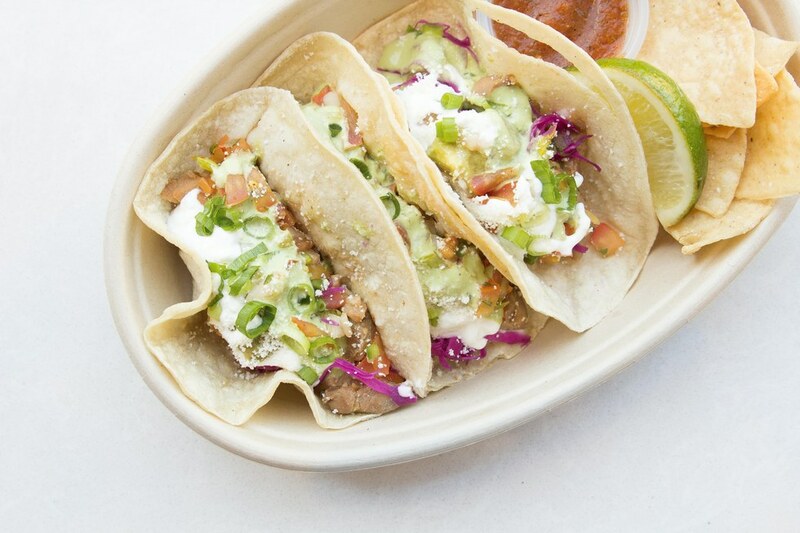 The Saucy Asian Tacos are a delicious combination of kimchi pico, crema, guacamole, slaw, and cheese. 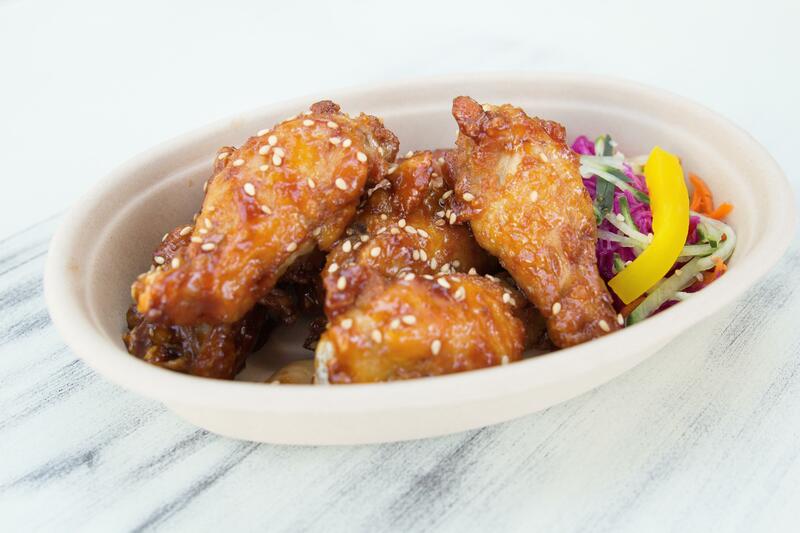 Side of chicken wings, please! 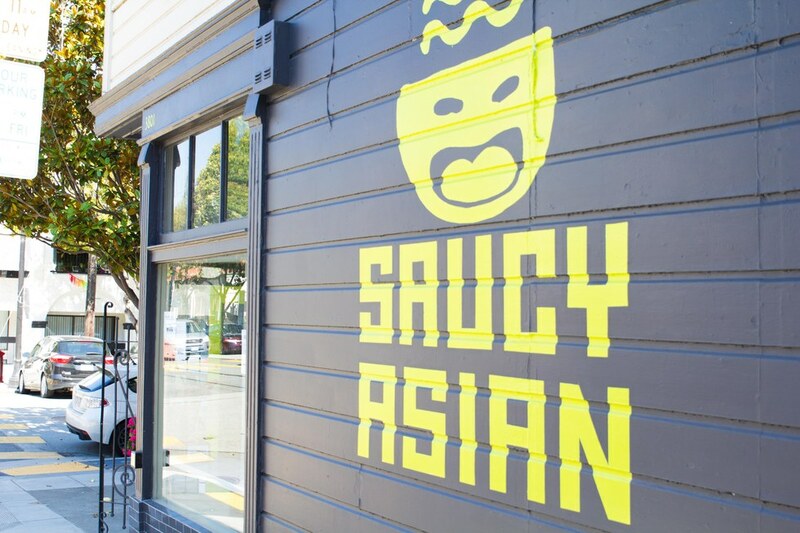 Saucy Asian has delicious wings in two flavors, soy garlic or sweet and spicy. 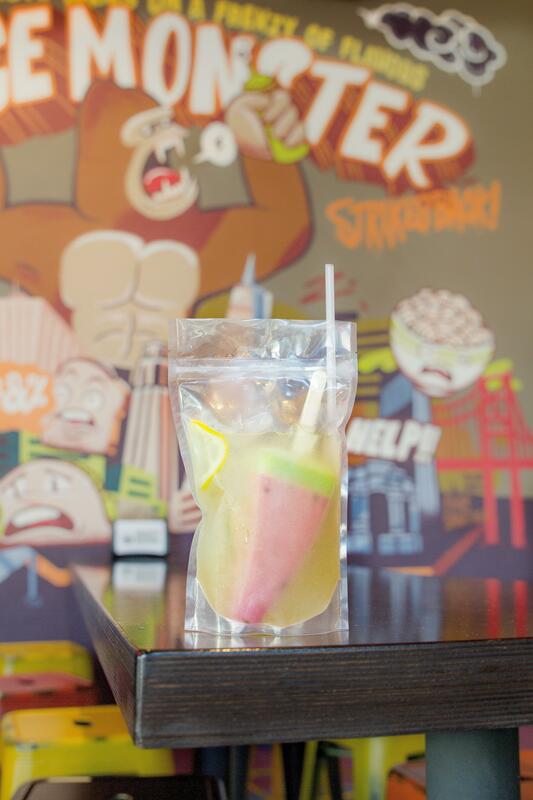 One of the best items on the menu is basically an adult Capri-Sun -- and we love it. Snag one of these signature bagged zippee drinks in seasonal flavors, embellished with a fun, fruity popsicle! 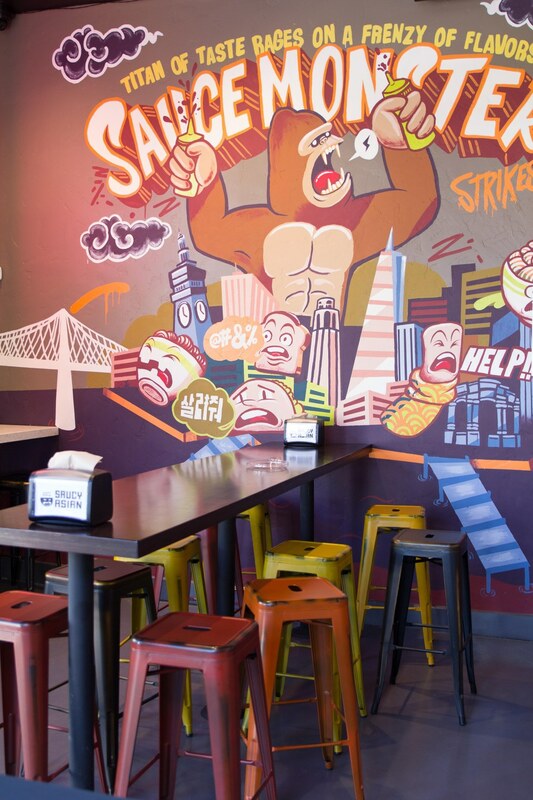 Relax with the funky, upbeat atmosphere, or grab your food (and zippee pouch!) 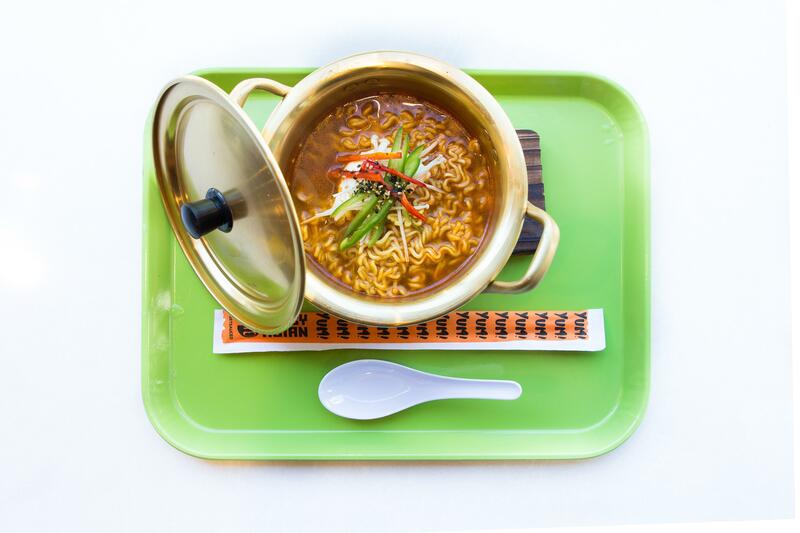 to go and head on over to Dolores Park.